A little over 200 years ago, the literary work we currently know as Pride and Prejudice began as First Impressions, a novel that was rejected by at least one publisher. But like a lot of great writers, Austen was persistent and rewrote the story. Pride and Prejudice was published in 1813–anonymously–even though it was Austen’s second book after Sense and Sensibility. To worsen matters, there have been some well-known members of the literary establishment (Ralph Waldo Emerson and Charlotte Bronte) who have had unflattering opinions of Pride and Prejudice. Others have pointed out that Pride and Prejudice should not be taken seriously because it deals with matters that are “domestic” as opposed to weightier subjects, such as the American and French revolutions. This last criticism misses one of the main attractions of Pride and Prejudice, i.e., as a comical and insightfull look into the economic and social plight of middle-class women in the late 1800s. Austen succeeds brilliantly in giving us a sense of what she and her contemporaries had to do in order to secure their futures in a society that greatly restricted the roles of women. Today, and quite amazingly, Pride and Prejudice continues to attract new readers. Not only has it sold millions of copies worldwide, it has been adapted for the stage, the screen and inspires such efforts as Pride and Prejudice and Zombies. Marvel has published it as a graphic novel, and Austen has inspired the creation of fan fiction, parodies, and websites (see below). Not bad for a young writer who was forced to leave school as a child because her parents could not afford to educate all eight(!) of their children. Fortunately for Jane, she was essentially home-schooled by her father and her brothers, and had unfettered access to her father’s personal library, a small luxury for those in the British middle class prior to the Victorian era. 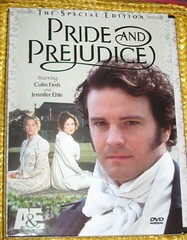 I am happy to include Pride and Prejudice in my personal library for a number of reasons. There are some issues I have with the book, but I ascribe most, if not all, of these issues as problems caused by the lack of careful editing by Austin’s publisher. Writing novels was a disreputable profession in Austen’s day, so it is not surprising that there are some missteps in the book which could have easily been corrected if someone at the publishing house would have been paying more attention. First, I will elaborate on some of these issues, then I will conclude with why I still find this particular classic worth your time. Shortly before the book group chose it for reading, a friend of mine had just finished reading Pride and Prejudice and told me that Austen used the word, “amiable,” (including variations thereof) over 30 times, according to the site, http://www.verbalworkout.com/ub/ub101/ub10171118.htm, which is comprised of a series of bullet-pointed quotes, usually followed by the phrase, “not reviewed by editor.” I could not tell if the editor in question was Austen’s editor or the website’s editor so I decided to perform my own “amiable” count and came up with 30 instances while I read the book. Why did Austen do that? Or, why did she use the word, “handsome,” 26 times? The answer is simply that almost all writers have quirks, and it is the editor’s job to point them out to the writer. William Edgerton was Jane Austen’s editor for Pride and Prejudice. See janeaustensworld.wordpress.com/2010/10/24/jane-austens-novels-were-edited-by-a-man/. In addition, she liked to experiment with her writing, producing a lot of messy manuscripts. That said, it is impossible for a writer to objectively evaluate their own writing. Mistakes are inevitable, which is why every manuscript gets proofread before it gets published by traditional publishing houses. Typically, someone other than myself reads this blog before I publish it, but that is no guarantee of perfection. Every day, the New York Times prints corrections to it’s earlier editions. Knowing this, I feel better. The above quotes are the opening sentences of 5 consecutive paragraphs. The formula consists of including the name of the character in the opening sentence, then moving on to a different character to begin the next paragraph. This has all the art of a grocery list. The second sentence of the final chapter is remarkable for two reasons. One, it contains the last use of “amiable,” and two, Austen suddenly begins using the personal pronoun, “I.” This is sudden in the sense that none of the preceding chapters features this point of view. In fact, the story is told, up to this point, from the main character’s point of view (Elizabeth Bennett). Again, we have Mr. Edgerton to thank for this shift. Another sudden shift in the structure of Pride and Prejudice occurs approximately halfway through the novel in chapter 35, where we read Mr. Darcy‘s letter to Elizabeth Bennett. This is the first of at least 13 or so letters that appear, causing many to label this as an epistolary work, but you would question the use of that term for the first 34 chapters. It is almost as if Austen showed a draft of her novel to someone when she was halfway through writing it, and was admonished to include some letters. There is certainly nothing wrong with using letters as a literary device. But not including any letters at all in the first half of the story, then including a dozen of them in the second half causes a noticeable imbalance. By now, those of you who are Jane Austen fans are probably wondering how it is that I can enjoy Pride and Prejudice after taking Mr. Edgerton to task for publishing a work that needed some polishing. (Yes, polishing. Very few editors today will grant writers the luxury of overusing words, sudden and heavy use of the epistolary style, and a last-minute change in the point of view.) My answer is that Pride and Prejudice made me smile and, occasionally, laugh at times. Austen (or Edgerton, and that is an entirely different issue) has a great ear for language and, as a result, the dialogue is sharp-witted to say the least. The heroine, Elizabeth, not only excels at pointing out the flaws of others, but learns to recognize her own flaws and how they have hindered her in life. Austen parodies the doyennes of her time in the character of Lady Catherine de Bourgh who invited herself into a conversation between Mr. Darcy and Elizabeth by saying, “What is it you are talking of?….Let me hear what it is” (126). Upon learning that the topic was music, Lady Catherine goes on to say, “There are few people in England…who have more true enjoyment of music than myself, or a better natural taste. If I had ever learnt, I should have been a great proficient” (126). We continue to hear similar things said, today, of course, but like Elizabeth, we are constrained by our relatively lower stations in life to keep our mouths shut. Elizabeth keeps mum in the face of Lady Catherine’s inanity until the end of the novel when they argue over the nature of the relationship between Elizabeth and Mr. Darcy. It is a great confrontation which serves to illustrate many of the qualities in Elizabeth that inspire readers today who want their heroines to think independently, unconventionally, and confidently, regardless of the consequences. Both Elizabeth and her father are my favorite characters in the book, and I suspect that Jane Austen and her father were just as entertaining in real life. ← Welcome to the book group blog’s new home!